You're very misinformed on who Tim Samaras was, and the nature of his chasing activities and the research upon which those activities were based. For starters, Tim was the principal investigator on the TWISTEX (http://en.wikipedia.org/wiki/TWISTEX) research project, which was the follow-up to a very sucessful spin-off of the original VORTEX project in the mid-1990's. TWISTEX involved the development and deployment of probes in the path of tornadoes to collect information on pressure, temperature, and near-surface wind fields. This sort of data is absolutely pivotal in closing the theoretical undertanding of tornadogenesis and, more importantly, the dynamics leading to the mainteance and lifecycles of tornadoes. "Closure" is a technical term which means "evaluate how well theory matches observations". Suffice it is to say that beyond enforcing no-slip, the near-surface boundary conditions supplied to various computational fluid dynamics models which resolve tornado vortices are ill-conditioned, and the nature of the storm you simulate in such codes is often times dependent on your assumption of boundary conditions. Axisymmetric models are especially sensitive here. 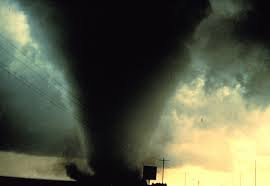 Measurements of transects of the pressure and temperature fields near the surface in a tornado are key to modifying those assumptions and identifying which ones are often at play, particularly when basic theory is extended to study the extra-ordinary flows near tornadoes. The research that TWISTEX performed can not be done in any other way than deploying instruments in the path of tornadoes. If you think you can identify better techniques, then I can assure you that there's a few hundred thousand dollars in grants from the federal government which you can easily win to fund the research. Furthermore, Tim Samaras was not one of those vain, thrill-seeking idiots you see videos of on YouTube. He was widely respected by his peers as a brilliant scientist with an impeccable safety record and attitude. None of his activities were "selfish". Many chasers will testify quite the opposite - a few have even expressed the belief that his lack of selfishness may have contributed to his death, as you would expect Tim to let others break rules of the road to jet to safety before he followed them out of harm's way. You're free to hold your own opinion of Tim Samaras, of course. But you should know that your opinions based on pure, undiluted ignorance. You are just lazy. Not even a shred of research done about Tim Samaras. Does it matter? He did what he loved, with his son who loved it too, why are you trying to insult the dead? Everything comes with a risk, I wouldn't want to live an unsatisfying life just to be safe. Have you seen that new animated movie The Croods? Would you be that character who stays in the cave from morning to dusk just to keep your family safe? There's much more to life than that and I'm sure Tim Samaras lived a satisfying life. He wasn't an amateur thrill-seeker who didn't know what he was doing. He did what he did with great precaution and the best of equipment. How can you even begin to think that what he did was selfish? Do you also think that soldiers who go out and defend their country are selfish too? Or martial-artists, or skateboarders, or stunt pilots? A life is measured by its width, not length. You're saying that because his hobby ended up killing him that it was selfish of him to pursue it, how terrible your life must be if you won't even allow yourself the opportunity to pursue what you enjoy,. I'm also sure he was seen as a great father given that his son was willing to storm chase with him. You can't complain about a man like that. The truth is we don't know how the rest of his family felt about what he did, but if I were married to a storm chaser, I wouldn't love her any less and I wouldn't stop her from doing what she loved because it's a gift to have something you love to do. Hope you feel guilty about your snide comment, towards a man who just died less than two months ago no less. Still feel the same. I absolutely still think it was selfish and the knowledge pointless. Pointless and easily gathered by other methods. Since you know so much, can you please tell me, without research, as your whole paragraph does this, any scientific facts about this storm, maybe something unusual about it? Also, can you explain to me the road networks which my brethren were on? Can you provide me alternative escape routes in a situation like what happened that day? Can you convince me to think with less brain power than you so I could understand what you are trying to prove? Thanks in advance. And no need to hide the comments, if you are so determined to try ruining the positive reputation of a great individual. You have no alternative but to think with less brain power than me. Nothing this man did was of any use to anyone except himself. He was a selfish man and his work was in vain.